Last week, I was invited to participate in a "White Vase Challenge" on Instagram. My blogger and Instagram friend, Kelley from kellynan.com invited me and 14 other talented bloggers and designers to style and share a white vase to post on Instagram. We all had such a great time! There were so many great ideas that came out of this challenge and I want to share them all with you. 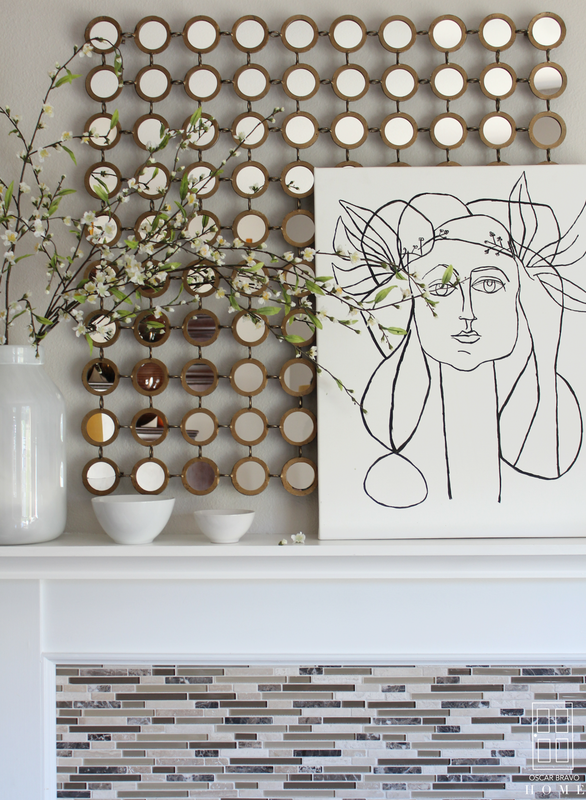 Check out what our "challenge host" Kelley Nan created in her white vase! 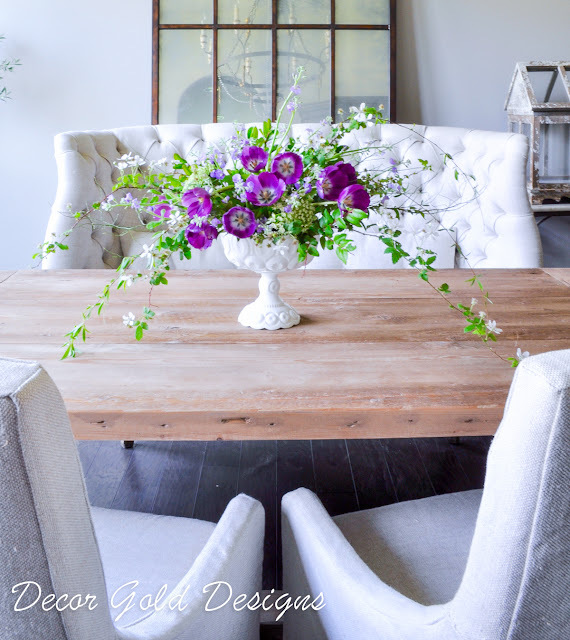 Kelley created this beautiful centerpiece in her dining room. She stuck to a monochromatic color scheme here, adding flowers AND fruit that are all from the same color family to create impact. A little contrast was added with the yellow flowers. Everything in Kelley's dining room is so gorgeous, I just want to go visit her and hang out in there. The talented designer, blogger and shop owner Loi from Tone on Tone Antiques created a simple yet impactful arrangement of forsythias in a white pitcher. 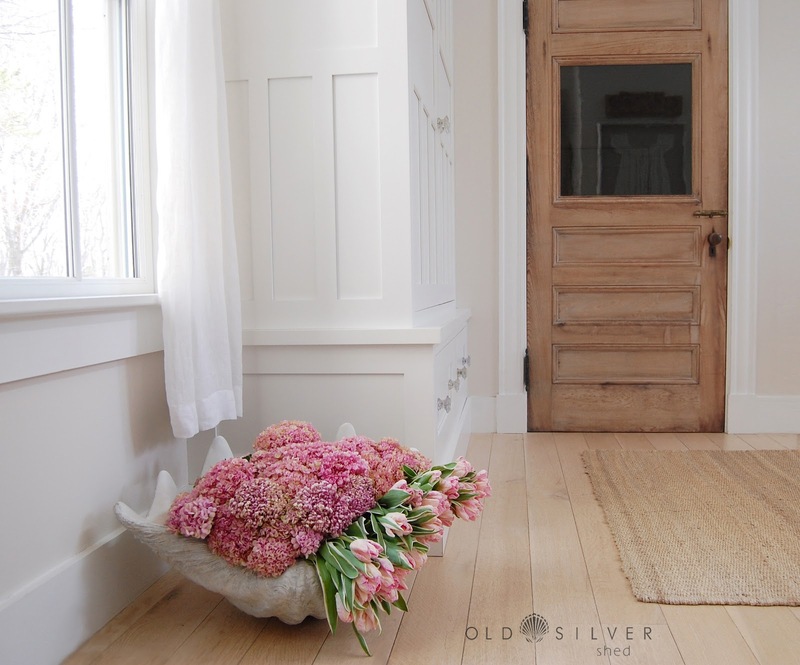 If you are a lover of white and bright, neutral spaces then maybe you can create a pop of color in your home with flowers. Did you just gasp a little? I know, right..?! This amazing creation in a shell was made by the talented Sandra from Old Silver Shed. (Look for her Instagram page; every-single-picture is AMAZING) Sandra put such a creative spin on the white vase challenge. This arrangement is so simple yet decadent. Is calm and peaceful not your thing? Then maybe you can create a vibrant and happy arrangement like my friend, Zabrina from zdesignathome.! 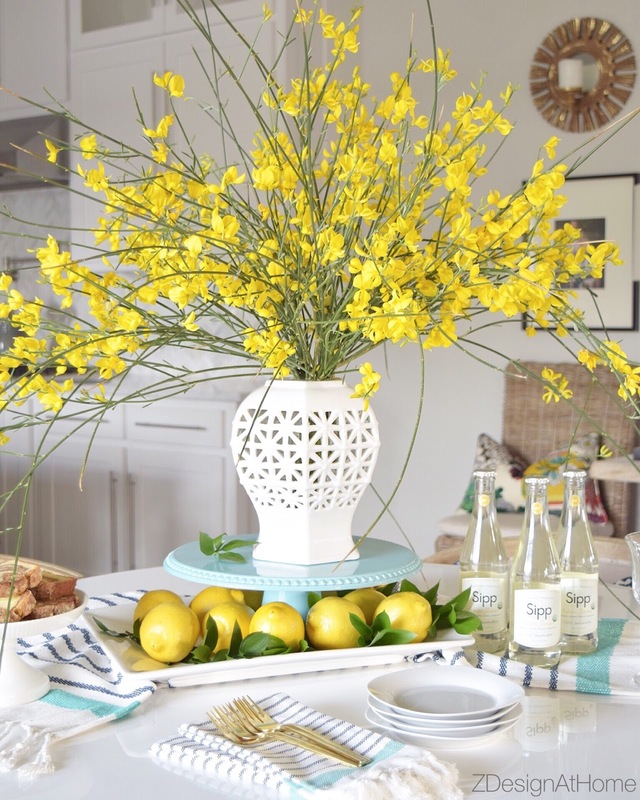 The burst of yellow forsythias in that beautiful vase makes me happy! I love how Zabrina added layers to her arrangement. Propping her vase on the cake stand makes the centerpiece feel so grand. I can totally see this arrangement on a buffet table for a spring brunch. Especially with those slices of marble cake...I know you were looking at those! Take a look at this yummy creation! My friend Shauna from The House of Silver Lining designed a beautiful arrangement of flowers and vegetables in her white vase. I love how much texture and color there is in her arrangement! Check out Shauna's blog for details on how to create this gorgeous (and healthy) centerpiece! AMAZING, right!? This is art. Janice is a master at arranging flowers! Her thoughtful approach to every detail makes this centerpiece stunning. Make sure you check out Janice's Instagram profile for more ideas on arranging flowers. Next up, we have Deborah's glam arrangement! This whole vignette is amazing! So much attention to detail. I love Deborah's unexpected use of violet and aqua. Such a fun twist to the challenge! If you don't know Deborah, please do yourself a favor and check out her Instagram feed at Blount Designs! Not only does she post swoon-worthy pics of her glamorous house, she's an absolute RIOT! Love her! If you have a more classic taste in centerpieces, then check out these classy ladies and their takes on the white vase challenge. My friend Jennifer created a beautiful centerpiece using purple tulips and clippings from her yard. I love that she took from her surroundings to make this lovely arrangement. The height of Jennifer's pedestal allows the flowers and branches to fall to the sides. Check out Jennifer's blog at Decor Gold Designs for more inspiration. She creates and showcases the most beautiful table settings ever! My friend Annie created a soft and feminine arrangement in her thrifted milk glass vase. And get this, Annie used a combination of real and faux flowers in her centerpiece! I swear to you, I cannot even tell which ones are faux! #fauxreal! Are you taking notes?! Remember, mix a few silk flowers in with the real ones just to add some volume. No one will ever know. Check out Annie's blog for the tutorial on how to make your own spring centerpiece at Zevy Joy. Next up we have this charming arrangement in a white pitcher done by my friend Jennifer, from The Grace House. Jennifer used lilies, hyacinths, tulips and berries to create this cheerful spring centerpiece. I love how this arrangement looks paired with her blue and white vases. Jennifer grouped 3 vases together and used 2 trays,but kept everything light and monochromatic. This is smart! A good tip to remember! If your arrangement seems a bit small for your table, expand it by grouping varying heights of vessels together and adding a tray (or two). Here's another great example of grouping items together and keeping things monochromatic. (By the way, in case you didn't know monochromatic means using only one color.) 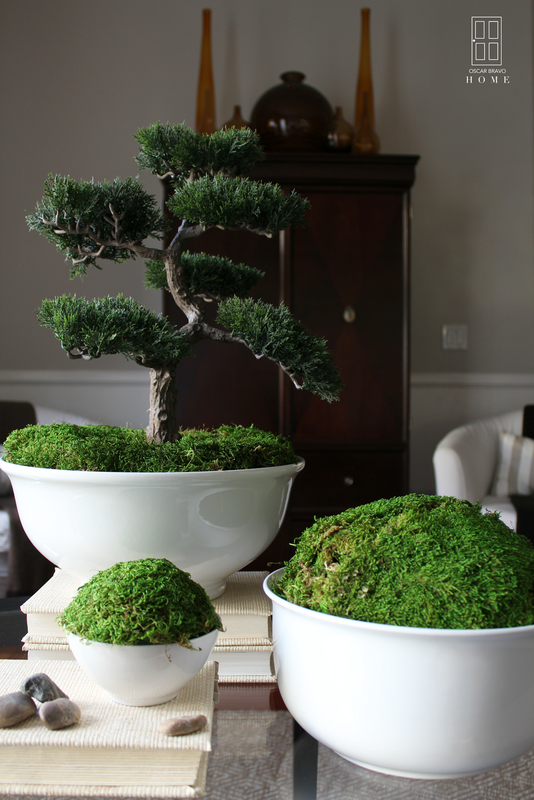 My friend, Tamara from Citrine Living kept things clean and classic in her vignette. She used a soup tureen to house some beautiful green hydrangeas, pears, artichokes and white roses. I LOVE THIS CLASSIC LOOK and of course, I love the green (my favorite color). Make sure you pay Tamara's blog a visit. You will love how she decorated her home! Flowers aren't only for the dining room! The talented Rani from Randi Garrett Designs created this GORGEOUS arrangement of eucalyptus, pink roses and clementines in her white vase. I love the sweeping shape of Randi's arrangement! The unexpected color combination of pink and orange with the pop of green looks so fresh. And, can you imagine how amazing the bedroom must smell with that arrangement in there? I cannot wait to try this combination out in my home. How is this for unexpected? The girls from The Spoiled Home, Sandi & Shalia used this cool porcelain hand for the white vase challenge what a conversation piece! The hand is holding some blooms that they collected from nearby Redbud trees. I love that! Sometimes you don't have to run to the florist to get your flowers. Just take a stroll along your neighborhood park to see if you can pick something up! (Just be mindful of what you take, you don't want to leave a tree bare or anything). I would always have fresh flowers there to welcome my guests. I mean, how happy would you feel opening the front door to see this!? This beautiful foyer is in the home of my San Diegan friend, Erin from The Sunny Side Up! Erin used a white flour canister for the white vase challenge. Love how the vibrant tulips pop! Take a cue from Erin and welcome your guests with a beautiful vignette and fresh blooms. Thanks for reading, friends! I hope you got some ideas for your spring centerpieces! Don't forget to subscribe to my weekly blog posts (if you haven't already) for more interior decorating ideas. Oscar! So cool collaborating on this awesome challenge. You totally slayed. Love your arrangement - original and brilliant. Loved doing this challenge with you Oscar! Yours is still one of my favorites! Thanks so much for the feature! Oscar, your interpretation was SO incredible. You upped the excitement and creativity 10 notches; thank you so much for joining in and for posting such a thoughtful recap! These spring centerpiece ideas are truly amazing. All this stuff is really inspirational for me. Keep sharing such posts. We are looking for affordable and spacious wedding venues NYC for my big day and then will pay attention to rest of arrangements. Congrats on your engagement! Thanks for stopping by and reading my post :) good luck with everything!